Samsung Galaxy Tab S3 price: how much does it cost? Update: Samsung has now confirmed the Galaxy Tab S3 release date and price for the UK. The Samsung Galaxy Tab S3 price has been announced today – and you should get ready to spend as much money on it as you would on an iPad Pro. It'll cost $599 in the US and £599 in the UK (about AU$780), according to Samsung, matching Apple's launch price for its 9.7-inch tablet. Goodbye, $499 flagship tablets. Pre-orders for the Galaxy Tab S3 open on Friday March 17 in both the US and UK, and you can get it on Amazon, Best Buy and from Samsung's official website. As far as the Samsung Galaxy Tab S3 release date goes, in-store availability is on track for March 24 in the US and March 31 in the UK. All Tab S3 orders come with the thicker S-Pen, so you don't need to buy it separately. The new S-Pen has functions similar to the ones that come with Note phones, with tools for Smart Select, Translate, Magnify and Glance in addition to handwriting and drawing capabilities. What you do need to buy separately is the Samsung Galaxy Tab S3 keyboard. It's a Pogo-attached keyboard that easily auto-pairs with the tablet. That costs $129.99, £119 (about AU$170) and its availability is scheduled for March 24/March 31 (US/UK), the same day the Tab S3 goes on sale in stores. If you pre-order the Galaxy Tab S3 before March 31 in the UK, you'll get the keyboard for free. 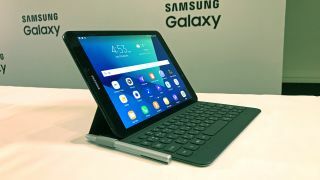 Samsung's new tablet for 2017 is being pitched as an productivity machine as well as an entertainment tablet, so this accessory is helpful for the former. Are its specs worth the price? We tested the Samsung Galaxy Tab S3 at MWC 2017, but we haven't been able to run a final review. From what we saw, though, it's an improvement over the Tab S2. It's another 9.7-inch tablet with a Quad HD display, but there's a noticeable difference on the Super AMOLED screen when you switch between HDR and non-HDR video. This means its high-res display is built for your entertainment future. Likewise, it runs Android 7.0 Nougat, has USB-C, and a 6,000mAh fast-charging battery. The S-Pen and keyboard accessories, meanwhile, make it a viable 2-in-1 device. There's a lot more here, so stay tuned for our full Samsung Galaxy Tab S3 review – and watch those old Galaxy Tab deals for falling prices if you want a cheaper slate.